As a thirty-something mother, my poster girl status is looking a bit tired and tattered. Bit like me really. I still don’t smoke, do drugs or drink in excess but I don’t think I can claim any brownie points. My exercise is now limited to chasing after my children, although I do try to squeeze in some classes. My now pescetarian lifestyle has left me pasta-rich and iron-poor. The yearly dental, optical and doctor check-ups often slide. My three meals a day tend to consist of my childrens’ left overs and the thought of making another sandwich for lunch leaves me a little ill. And through all this I am acutely aware that I need to lay solid foundations for healthy living for my sons. The healthy living that came so easily in my twenties, is a struggle in my thirties. Yet, I know it’s more important than ever. Time to start being a little kinder to this body of mine. I may not treat it like a trailer park, but I am not treating it like a temple either. One of the easiest ways for me to treat my body better is to watch what I am eating. I am not talking dieting, but rather awareness of the foods I am consuming and making good choices based on the facts available to me. It’s something that I want to teach my sons – that we should know about our food. Ideally we would avoid packaged foods all together and the content of our food would be self-evident. I would bake our bread and blend our muesli. But I have to be realistic – that’s not going to happen. Nor is reading the back of every food packet as we shop – you ever tried that with an 18 month old? Enter the Bupa FoodSwitch app. 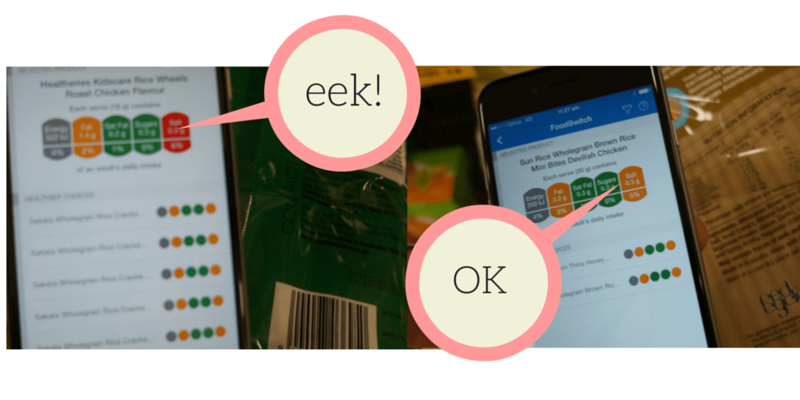 This app allows you to scan the barcode of most foods and gives you a report card on fat, saturated fat, sugar and salt content. The report is colour coded, so you can see at a glance whether or not the item really needs a re-think. It also suggests similar but healthier options. Using it on our weekly shopping trip was an eye-opener. First stop was treats for the school lunchbox. I must admit I was both curious and fearful about this. Rice cracker snacks are a lunchbox staple and bribery treat in our house. The fact they are stocked in the health food aisle alleviates my conscious on the matter, but it still niggles. As suspected, our pantry staple isn’t the healthiest option out there, containing high levels of salt. So we decided try something similar but with a salt content within the orange, rather than red, indicator. Master I was pretty interested in the visual cues and helped decide on the healthier option. Muesli bars are one of those things that I buy for the kids but often end up eating myself. I am quite partial to the choc chip variety. A quick scan using the FoodSwitch app revealed that I may as well just reach for the Tim Tams. Fats, Sugar and Salt all falling squarely in the red zone. So we are trying a healthier muesli bar this week. I have never given much thought to our bread choice. We eat wholemeal bread and that always seemed pretty healthy. I was horrified at the amount of salt contained within our normal choice and using the app switched to another kind, with half the salt. I was really surprised to find such a wide variance in the amount of salt used in basically the same kind of bread. My kids love poppers but I know juice is the work of the sugar devil. The variety we normally buy didn’t score so well, but another apple juice fared much better and didn’t enter into the red zone. They were also on sale. Win. It actually felt quite empowering to shop with so much information and I was surprised at the variance between similar items. We didn’t need to change what we ate drastically, but we were able to make more informed choices. The app is simple to use and very responsive. Being given a number of healthier choices makes the comparison process quick. The colour cues make it easy to get the kids involved. If our regular choice fell into the green or orange zones, I didn’t look to make a switch but that red zone was definitely a motivator to look for healthier choices. Whilst I only used the the FoodSwitch option, there is also a GlutenSwitch option which I know would be great for so many families. Next time some of our little gluten-free friends come to play, I will definitely be using the app to check out what we will have for afternoon tea. You can download the Bupa FoodSwitch App Here. All in all I am feeling more confident about our food choices. Really still need to work on that sunscreen application though. Bupa Australia and The George Institute for Global Health provided a shopping voucher for the purpose of this post. All opinions are my own. Have you used the FoodSwitch app? Any surprises? Do you like to believe everything in the health food aisle is healthy? I must check this out, looks like a simple way to make smart choices. And yay for free food vouchers! It really is pretty great and yes, my family almost forgave me for blogging when the free voucher arrived! Great review- definitely makes me want to check it out! Thanks Dawn – it really is a useful app, and it’s always nice to use our phones for useful things! That looks super quick and easy – the colour coding thing is a great idea. It’s so time consuming reading labels, especially with impatient kids whining at you. It’s important to know though; even our pack of favourite (I thought healthy) spinach wraps ended up absolutely brimming with sodium! Easy switch to wholemeal, and they taste almost as good. Thanks for the heads up! Salt + bread products = Minefield. I was completely unaware of the high levels of sodium. Oh! Interesting! Must download it ! Ps..I had to lookup what pescetarian was..
It’s what lapsed vegetarians call themselves 😉 It really is a handy app. It’s one of the more useful apps on my phone – that’s for sure! I like the look of this app!